‘First Past the Post” is dying, we use other systems for the European parliament, executive mayors, the Greater London Authority and in Northern Ireland, it’s time to move on. I shall be voting for AV today, it’s not my first choice, but its better than what we have, why don’t you join me? On issues of tribalism I was unhappy to receive a No2AV leaflet, with a picture similar to the one on the left. I have tried to scan the original to share with you, but my scanner isn’t good enough. Interesting that they have Cameron’s back to us. Are they hoping that Labour and other left wingers will forget that the coalition is Tory led by the simple ruse of having him turn his back on us?. (It won’t be the last time!) The leaflet is decorated with text in UKIP’s Purple and Yellow. (Did they have some ink left over from the General Election?). The text suggests that we should oppose AV because of broken promises and back room deals, and that we, the voter, should punish the dishonest. It’s merely another attempt to keep the interests of the Tory party out of the debate. How stupid do they think we are? 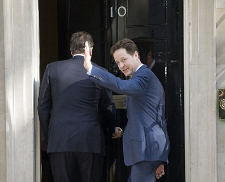 Why should we punish only Clegg and the Lib Dems for a deal they did with the Tories! Anyway, outside London we can punish them both in the local & national elections by voting against them. The biggest lie is that the current system is in democracy’s interest. If you vote on the merits of fair voting, you’ll support change, otherwise you have a party agenda, and the Tory Party agenda at that.